How Do You Solve a Word Problem by Dividing with Decimals and Rounding Your Answer Up? You never know where division might pop up! This word problem is a great example of using long division to solve a problem. 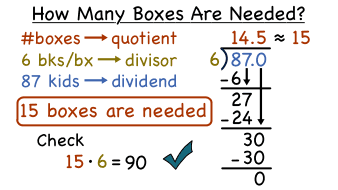 Use decimal notation for fractions with denominators 10 or 100. Have you ever looked at the price of something? It's usually given as a decimal! Decimals are a very helpful part of math and can be found in may places in the real world. Watch this tutorial to learn all about decimals! How Do You Solve a Word Problem by Dividing Whole Numbers? Word problems are a great way to see math in the real world! Math can help us answer everyday questions. Watch this tutorial to see how division is used to solve a word problem. How Do You Do Long Division with Decimals? We know that calculators are everywhere, but that doesn't mean that long division isn't important! Sometimes you won't be allowed to use a calculator, and when those times occur, you'll be thankful that you watched this video! Write expressions that record operations with numbers and with letters standing for numbers. How Do You Determine Which Operations to Use in a Word Problem? Turning a word problem into a math problem you can solve can be tricky. Luckily, there's some key words to look out for in a word problem that help tell you what math operation to use! This tutorial shows you some of these key words to look for in a word problem.